‘Casi Renée was born on June 3rd, 1995 and scored 8 & 9 on the APGAR scale. She was a very healthy and beautiful little girl and taught me a love I didn’t know existed. We were warned by chiropractors while I was pregnant with her, about the risks involved with vaccines. Casi had an immunologist pediatrician, who told me she would die if I did not vaccinate. She received her 1st Hepatitis B vaccine on 6-19-95. I was told of no risk and was even given a bottle of Tylenol to mask the symptoms of any reactions. Within days she developed a rash following the vaccine, but the pediatrician didn’t seem to be concerned. Casi was given HBPV, OPV, DPT and her 2nd dose of Hepatitis B on 7-27-95. She was very floppy and when we lifted her arm or leg, it would just drop. On 9-27-95 she received another dose of DPT, HBPV and OPV. Her floppiness continued and within a week, she developed eczema and resisted being put on her belly…Mentally we didn’t notice any problems, but physically we were a little concerned. When we brought it up to her pediatrician and again she didn’t seem concerned. Casi received DPT and HBPV on 11-30-95. Her eczema was out of control and we noticed her babbling stopped immediately. We couldn’t get her to play peek-a-boo any longer and all she wanted to do was lay on her back. We also noticed she constantly wanted to arch her back and thought she was fascinated with ceiling fans and lights. She stopped developing normally and the pediatrician’s response was “All children develop differently, so do not compare her with others”. Casi received her 3rd dose of Hepatitis B on 3-12-96 and within a month, we noticed a lot of noise in her joints and she began rolling to get around. She would cry when we would put her on her belly or try to get her to stand. We also realized that she was not advancing mentally or physically. She became very quiet and passive, so we thought we had the perfect self-entertaining child. At Casi’s 1-year birthday, everyone in our family realized that something was wrong. She was not going from a lying to a sitting position on her own. When we confronted the pediatrician and demanded some answers, she referred us to one of the top pediatric neurologist. He diagnosed her with hypotonia, which is low muscle tone and did a lot of testing. Everything came back normal, so he referred us to a physical therapist and wanted to see her in 3 months. The physical therapist suggested autism, because she had an autistic son and was familiar with their characteristics. Casi received physical, occupational and speech therapy 2 times a week. The neurologist said “absolutely not” to autism and when I asked about the vaccines being responsible, he wouldn’t even consider the possibility. We chose to no longer use Casi’s pediatrician and were referred to another one, by my OBGYN. On 9-26-96, he gave her the MMR and HBPV vaccine. Her development still was very slow and we started getting very alarmed and desperate. Here we had the best neurologist in South Florida, and he could not give us answers. We kept taking her to the physical therapist twice a week and taught her how to crawl. Within weeks after the MMR vaccine, she developed chronic constipation. I suspected the vaccines being responsible for Casi’s problems and spoke to the pediatrician about my concern. 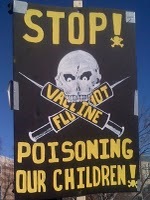 He did not agree and suggested she receive the safer version DTaP vaccine, along with OPV and TB screening on 12-19-96. I still wanted to believe the pediatrician knew best and gave into his fear. We finally taught Casi to walk at 22 months old. She was very unstable and fell a lot, but seemed to get around…Casi’s neurologist requested MRI’s, cat scans, EEG’s and came to no conclusion. We took her to several specialist, even two other neurologists and no one could give us answers…Casi never said a word and after seeing every specialist available, she was labeled as autistic. In May of 1999, Casi started running fever and blood work showed she was positive with the epstein bar virus (mono), which I learned was also due to the vaccines. Casi was diagnosed by a top infectious disease specialist and he was confident there were no other problems. She had on and off fever for 7 weeks, lost a lot of weight and missed many days of school. Casi inevitably contracted bacterial meningitis and was not properly treated at the hospital. She passed away 10 days after her 4th birthday and the only reason I’m able to breathe today, is because God made my mission in life very clear. I have dedicated the rest of my life to doing WHATEVER is necessary to help these innocent victims and to protecting children-yet-to-be, from the autism epidemic.’ April Renée’s testimony on the rapid decline & eventual death of her daughter Casi Renée attributed to Vaccine trauma. This is an utterly tragic case, but unfortunately relatively common. Most Pediatricians lack any proper grounding in diagnosing vaccine related neurological degenerative type symptoms. According to Dr. Russell Blaylock, trusted world renowned brain surgeon, on average, doctors spend the equivalent of a weekend seminar learning this crucial aspect of child care – approximately seven hours of careful, focused study into the complex strata of auto-immune breakdown type complexities. Without this fundamental bedrock of knowledge a critical component is missing from any doctor’s arsenal, considering the widespread impact neurological side-effects to vaccines have had on the community at large. When their expertise is required the most, doctors will often misdiagnose the symptoms, overlooking the tell tale signs which indicate a vaccine allergy – or worse, gradual auto-immune failure and an ultimate spiraling toward regressive Autism, Meningitis & the eventuality of premature death. 1) A rash developed immediately upon receiving the first Hepatitis B shot. 2) The child’s limbs became floppy after receiving the HBPV, OPV, DPT & second Hepatitis B shot. 3) Increased floppiness, an outbreak of Eczema & dissociative Autistic-type behavior was noted after DPT, HBPV & OPV shots. 4) A worsening of Eczema & Autism symptoms including complete withdrawal, arching of her back & obsession with ceiling fan/hands swirling was noted after receiving the next round of DPT & HBPV shots. 5) Cracking of the joints & rolling around on back, a refusal to lay on her stomach, mental & physical developmental delay & further behavioral withdrawal (silence) was noted after receiving the third Hepatitis B shot. 6) Chronic constipation & full blown symptoms of Autism including serious developmental delay was apparent after receiving the MMR & HBPV shots. 7) The child was diagnosed Hypotonia after receiving the next round of DTaP & OPV shots. 8) The child later developed Epstein Bar Virus, commonly associated with Autism. 9) Bacterial Meningitis followed. Dr. Russell Blaylock has labeled this condition an auto-immune type disorder brought on, in part, by vaccine trauma. The parent’s analysis sums up the typical mistakes often made by doctors too quick to dismiss the obvious. ‘She stopped developing normally and the pediatrician’s response was “All children develop differently, so do not compare her with others”. HEPATITIS B VACCINE (RECOMBINANT) Viral vaccine derived from hepatitis B surface antigen (HBsAg) produced in yeast cells. A portion of the hepatitis B virus gene, coding for HBsAg, is cloned into yeast (GMO), and the vaccine for hepatitis B is produced from cultures of this recombinant yeast strain. Pediatric Formulation contains 5 mcg of hepatitis B surface antigen. The purified protein is treated in phosphate buffer with formaldehyde and then coprecipitated with alum (potassium aluminum sulfate) to form bulk vaccine adjuvanted with amorphous aluminum hydroxyphosphate sulfate. Note: According to EPA standards 50 micrograms of Thimerosal (50 µg/mL) constitutes a safe level for an 1100 pound adult. Even half that level (25 µg/mL) – a safe level for a 550 pound adult, not a baby. Hepatitis B virus (HBV) infection is not a childhood disease. It is associated exclusively with high-risk sexual activity & shared needle injection-type drug use. “Hepatitis B continues to decline in most states, primarily because of a decrease in the number of cases among injecting drug users and, to a lesser extent, among both homosexuals and heterosexuals of both sexes,” according to CDC (1996). DPT VACCINE (Diphtheria, Pertussis Tetanus): Diphtheria and Tetanus Toxoids and Pertussis Vaccine Adsorbed SmithKline Beecham Pharmaceuticals 1-800-366-8900 ext. 5231 produced using diphtheria and tetanus toxoids and acellular pertussis adsorbed, aluminum phosphate, formaldehyde, ammonium sulfate, washed sheep red blood cells, glycerol, sodium chloride, thimerosal medium: porcine (pig) pancreatic hydrolysate of casein. 1948 Study on Pertussis vaccine reaction/Harvard Medical School. They examined 15 children who had reacted violently within 72 hours of a Pertussis vaccination. All the children were normal before the shot. None had ever had a convulsion before. One of the children became blind, deaf, spastic and helpless after being given the Pertussis shot. Out of the 15 children, two died and nine suffered from damage to their nervous system. TETANUS – Tetanus as a clinical entity is linked to a bacteria, Clostridium tetani. Obviously, the germ is not as malicious as one may think because it lives as a harmless commensal in the animal and human intestinal tract (1). It is not the very presence of the bacteria which causes the trouble, but the toxins that are produced by the bacteria under anaerobic conditions, that is, where the bacteria operates in an environment free of oxygen. These toxins can be spread through the blood vessels and finally affect the nervous system causing tetanic muscle contraction and pain. The condition is extremely painful and potentially lethal. Tetanus morbidity is very low in industrial countries. In the USA, for example, there are only about 50 cases a year (2); in Germany, 17. Mortality figures range between 33% (4) and 20%. The incidence is higher in tropical countries and under poor hygienic conditions. Mortality is 135 times higher in developing countries compared to developed countries. In those countries, tetanus in newborns plays a very important rote. Most of those cases are caused by using dirty, rusty scissors when cutting the umbilical string of the newborn. 1. 1 fatal outcome in 500 DT vaccinations. 2. Fever is not a normal reaction. 4. Allergic reactions after tetanus vaccination occur due to hypersensitivity to any of the components of the vaccine. Infection occurs through defects in the skin or mucosal barriers. Hygienic occlusion of such defects when in contact with potentially infected matter (dust, horse manure) is a first essential measure. Profound wound cleaning is the next very important measure. Every wound should be allowed to bleed freely, since this eliminates bacteria and infected matter from the wound and supplies oxygen through the blood stream. It is an inexcusable professional mistake to sew infected wounds. They should be left open to the air until completely clean before being stitched. Application of hydrogen peroxide is another cheap, easy, very efficacious and, thus, essential protection against tetanus infection of open wounds. The only exception is small punctured wounds in which the peroxide will not permeate. Peroxide is the first essential product in every household pharmacy. In order to be effective, it has to be replaced annually. VACCINE LEGACY: We know the Tetanus shots in the 90’s were contaminated with Immune-Suppressant Contraceptive in the form of HCG, a hormone crucial to female fertility balance. By inserting HCG next to a deadly live virus into the body the immune system would react to both intruders as hostile. The end result saw hundreds of thousands of healthy women inadvertently sterilized by these shots. Millions of female Mexicans, Nicaraguans and Filipinos were duped into taking tetanus vaccines, some of which were laced with a female hormone that could cause miscarriage and sterilization. In 1995 a Catholic organization called Human Life International accused the WHO of promoting this Canadian-made tetanus vaccine covertly laced with a pregnancy hormone called human choriogonadotropic hormone (HCG). Suspicions were aroused when the tetanus vaccine was prescribed in the peculiar dose of five multiple injections over a three month period, and recommended only to women of child-bearing age. When an unusual number of women experienced vaginal bleeding and miscarriages after the shots, a hormone additive was uncovered as the cause. HBPV Vaccine (Haemophilus B Polysaccharide Conjugate Vaccine): PedvaxHIB® (manufactured by Merck) [Haemophilus b Conjugate Vaccine (Meningococcal Protein Conjugate)] is a highly purified capsular polysaccharide (polyribosylribitol phosphate or PRP) of Haemophilus influenzae type b (Haemophilus b, Ross strain) that is covalently bound to an outer membrane protein complex (OMPC) of the B11 strain of Neisseria meningitidis serogroup B. The covalent bonding of the PRP to the OMPC which is necessary for enhanced immunogenicity of the PRP is confirmed by quantitative analysis of the conjugate’s components following chemical treatment which yields a unique amino acid. The potency of PedvaxHIB is determined by assay of PRP. Haemophilus influenzae type b and Neisseria meningitidis serogroup B are grown in complex fermentation media. The PRP is purified from the culture broth by purification procedures which include ethanol fractionation, enzyme digestion, phenol extraction and diafiltration. The OMPC from Neisseria meningitidis is purified by detergent extraction, ultracentrifugation, diafiltration and sterile filtration. Liquid PedvaxHIB is ready to use and does not require a diluent. Each 0.5 mL dose of Liquid PedvaxHIB is a sterile product formulated to contain: 7.5 mcg of Haemophilus b PRP, 125 mcg of Neisseria meningitidis OMPC and 225 mcg of aluminum as amorphous aluminum hydroxyphosphate sulfate (previously referred to as aluminum hydroxide), in 0.9% sodium chloride, but does not contain lactose or thimerosal. Liquid PedvaxHIB is a slightly opaque white suspension. ‘Single 0.5 mL i.m. injection beginning at 2 months, followed by a second 0.5 mL i.m. injection two months later. When the primary two-dose regime is completed before 12 months of age, a booster is required. NOTE: “This child eventually died from contracting Meningitis.” Merck had yet to recall this version of the vaccine in 1995 when she received it. OPV VACCINE (Oral Polio Virus Vaccine): ‘Contains live attenuated Poliovirus (Sabin strain types 1, 2 and 3) and is intended for polio prophylaxis in infants 6-12 weeks of age, all unimmunized children up to 18 years of age, and high-risk adults. The attenuated virus particles in OPV are harvested from monkey kidney cell cultures and undergo an extensive purification process. OPV is administered multiple times to ensure immunity to all three types of poliovirus. Poliovirus antibodies are distributed into breast milk. It is unknown if poliovirus antibodies cross the placenta. The first 0.5 ml PO dose should be administered at 6-12 weeks of age. The second 0.5 ml PO dose should be administered preferably 8 weeks after the first dose. The third 0.5 ml PO dose should be administered at 6 months of age. Contraindications/Precautions: Patients with evidence of viral infection (diarrhea, vomiting) should not be given OPV because other enteroviruses within the intestinal tract can inhibit immunity by preventing OPV replication. Similarly, OPV inoculation should be postponed in patients with fever or a severe respiratory infection, although minor illness does not preclude OPV administration. Intramuscular injections, especially antibiotics, should be avoided for at least 30 days in patients who have received the poliovirus vaccine live oral (OPV) or for 60 days in patients who acquired the disease by contact with vaccine recipients. Intramuscular injections were associated with an increased risk of developing paralytic poliomyelitis in patients receiving IM injections 30 days prior to the onset of paralysis. Poliovirus antibodies may be excreted into breast milk, and breast-feeding is not recommended for 2-3 hours before or after inoculation in neonates immunized at birth. M-M-R II is a sterile lyophilized preparation of (1) ATTENUVAX* (Measles Virus Vaccine Live), a more attenuated line of measles virus, derived from Enders’ attenuated Edmonston strain and propagated in chick embryo cell culture; (2) MUMPSVAX* (Mumps Virus Vaccine Live), the Jeryl Lynn** (B level) strain of mumps virus propagated in chick embryo cell culture; and (3) MERUVAX* II (Rubella Virus Vaccine Live), the Wistar RA 27/3 strain of live attenuated rubella virus propagated in WI-38 human diploid lung fibroblasts. Dr. Andrew Wakefield’s 1998 Study demonstrated “anti-myelin antibodies and digestive tract pathologies in children with autism after being given the Urabi strain triple live virus MMR vaccine. All 12 children in the Study had intestinal abnormalities (known as Inflammatory Bowel Disease), with chronic inflammation in the colon in 11 of the children. Noted behavioral disorders included autism in 9, disintegrative psychosis in 1, and possible post-viral or vaccinal encephalitis (acute brain inflammation) in 2. Since that release there have been countless other studies verifying exactly the same pattern – including the presence of measles lingering in the bowels of young children who have gotten of the Measles-Mumps-Rubella shot (MMR). The Urabi strain MMR vaccine purchased by GlaxoSmitheKline for distribution in the UK, a triple live virus version, was directly responsible for an sudden spike in childhood Meningitis in the UK. It had been banned from use in Canada & was warned against further use in Britain by Canadian specialists. This was all suppressed by GSK & The British Gov’t. ‘New documents have come to light confirming our report of intestinal disease & autistic regression following MMR vaccine published in the medical journal THE LANCET in 1998, The documents prove that there was no fraud. They describe 7 (of 12) of The Lancet children, and were written by Professor John Walker-Smith in December 1996, 14 months before our team’s paper was published…Professor John Walker-Smith prepared the documents as a report for a scientific meeting based upon his own assessment of the children’s disorder, supported by the study’s senior pathologist Dr. Dhillon. Child 2. MMR at 15 months – head banging 2 weeks later. Caecum: lymphoid nodular hyperplasia with erythematous rim and pale swollen core. MMR at 15 months – behaviour changed after 1 week. Child 5/6. MMR at 14 months. Second day after, fever and rash, bangs head and behaviour abnormal thereafter. Histopathology: Marked increase in IEL’s [intraepithelial lymphocytes] in ileum with chronic inflammatory cells in reactive follicles. Increase in inflammatory cells in colon and IELs increased. Note: The common denominator in these records – every child diagnosed by Dr. Smith in 1996 had received the MMR shot by 15 months; and thereupon rapidly developed ‘Intermediate Colitis’ (a form of Inflammatory Bowel Disease) & symptoms of Early Onset Arash, fever, behavioral changes including head-banging, screaming attacks, hyperactivity, growling voice). “What is needed therefore is a safer vaccine that does not give rise to these problems, and a treatment for those with existing IBD (Inflammatory Bowel Disease). I have now discovered a combined vaccine/therapeutic agent which is not only most probably safer to administer to children by way of vaccination/immunization, but which also can be used to treat IBD whether as a complete cure or to alleviate symptoms. ‘Infections with measles, mumps and rubella viruses are confined to man and occur worldwide. They are all spread primarily via the aerosol route. Each of these viruses exists as a single serotype (Paramyxovirus, Rubulavirus, Morbillivirus, Pneumovirus). MMR (mumps, measles, rubella) vaccine contains live, attenuated forms of all three of these viruses…Measles vaccine can cause problems (e.g. fatal giant cell pneumonia) in those with severely compromised cell-mediated immunity. Another sadly misinformed & misguided Doctor spreading misinformation – “The risk is that as we have more parents who choose not to vaccinate their children, then we’ll see more outbreaks of these vaccine-preventable diseases. We know that vaccinations have eliminated or significantly reduced many preventable diseases. The risks of vaccination are very minor compared to the risk of the disease itself. If a kid gets measles, they could get pneumonia. They could die. It seems that we have this population that is all about natural healing, natural immunity. It’s that sort of philosophy of life. As a public health professional and a medical doctor, I disagree. I don’t believe that natural immunity is safer than immunity through a vaccination. My grandparents grew up in a time pre-vaccination, and they knew people who had measles or polio. But my generation grew up with vaccinations, and I haven’t seen anyone stricken with polio.” Dr. Jennifer Mullendore, medical director of the North Carolina county Health Department. These are the body’s primary antioxidants, essential to regulating Free Radicals (unpaired Electrons) throughout the body, staving off Cancer, Diabetes, Autism, Schizophrenia & the rapid macro-degeneration of cells. a. Hyperbetacarotenemia, a form of intestinal disfunction linked to Measles (from the MMR shot) is marked by excessive beta-carotene in the blood & Vitamin A depletion. Studies conducted in 1958 and 1961 confirmed that the wild measles virus has a severe short-term effect on immunity and the child’s nutritional status, especially vitamin A which is obliterated by the intervention of such a virus. Vitamin A plays a central role in the development & differentiation of white blood cells, such as lymphocytes, which are essential to the immune response. Vitamins C & E are dependent on Vitamin A. Therefore the bedrock of your immunity is compromised. b. Starved of Vitamin D3: As a result the Lymphocytes in their lungs can’t process Vitamin C & E, which leads to Respiratory disfunction & increased vulnerability to ALL infections. Vitamin D is required to increase the circulation of calcium and phosphorous, two minerals necessary for healthy bones. The kidneys produce Vitamin D3 & the liver plays a vital role in the functioning of D3 throughout the body. When these organs are compromised , it will throw your entire metabolism off. d. Vitamin C is required for the synthesis of collagen, the intercellular “cement” substance which gives structure to muscles, vascular tissues, bones, tendons and ligaments. Vitamin C is also able to regenerate Vitamin E but not when the Vitamin D3 levels drop off. e. Vitamin E is an antioxidant which intercepts free radicals and therefore prevents lipid destruction chain reactions. It maintains the integrity of cell membranes. After reactions with free radicals the antioxidant function of vitamin E is lost. Vitamin C is able to regenerate Vitamin E levels but not when the Vitamin D3 levels drop off. f. Heavy metals rapidly deplete Selenium in the body. Selenium is necessary for Glutathione production (the body’s primary antioxidant). This causes a chain reaction which triggers liver damage, diabetes, cancer & in the long term, heart failure. g. The Thyroid gland is key to overall health which produces T3 & T4 hormones (Iodine Atoms). Iodine helps regulate metabolism in the body. Thyroid synthesizes vital T3 (rare) from T4 (plentiful). Body needs 150 mg per day – 80% comes from T4 conversion to T3 in the Liver. Vaccine derived heavy metal toxicity neutralizes this function. h. Damage to the Methylation process – Methylation assists in a critical stage of early development involving the viability of cells, ‘an on/off switch that allows the body to learn how to respond to environmental change. It represents the only cellular pathway that effects both adaptability and structural integrity of the body. i. Antimitochondrial antibodies are elevated; which suffocates Eukaryotic cells (complex structures enclosed within membranes). Mitochondria are the battery pack of your cells. “Mitochondria play an important role in controlling the life and death of a cell. Consequently, mitochondrial dysfunction leads to a range of human diseases such as ischemia-reperfusion injury, sepsis, and diabetes.” Most Eukaryotic cells contain other membrane-bound organelles such as mitochondria, chloroplasts & Golgi body. “Primordial eukaryotic cells lacked ability to use oxygen” – excerpt/Autistic case file. So you’re seeing 5 major antioxidants in the body, all essential to regulating your overall metabolism, Liver, Kidney, Thyroid, Methylation & Mitochondrial function generally neutralized in these children with Autism; and all the evidence points to heavy metal toxicity. Note: All vaccinated children, regardless, are susceptible this depletion to a lesser or greater extent. GIRLS 4 TIMES LESS PRONE TO AUTISM. POTENTIAL REASONS: Girls are developmentally ahead of boys early in life (undoubtedly a species survival mechanism). The female Mylene Shealth & blood-brain barrier may also be stronger. The connective tissue that allows communication between the two hemispheres of the brain tends to be thicker. Estrogen is also believed to decrease Thimerosal’s toxic affects; versus testosterone which greatly increases the toxicity. X & Y CHROMOSOME: ‘Every DNA molecule is composed of two strands. When a cell detects a DNA duplex with a difference between its two DNA strands, that duplex is “repaired” by the rather Draconian expedient of chopping out the entire region, on both strands of the DNA molecule. No effort is made by the cell to determine which strand is correct — both are discarded. The gap that this creates is filled by copying off the sequence present at that region on the other chromosome. All this editing happens when the two versions of the chromosome are paired closely together in the early stages of gamete (egg and sperm) formation, the process we biologists call meiosis. All females have two copies of the “so-called” X chromosome. The X chromosome is about the same size as other 22 human chromosomes, which also occur in pairs, and like them is packed with some 1000 genes. The reason there are two copies of the X and other chromosome is to allow for the repair of the inevitable damage that occurs over time to individual genes because of wear-and-tear, chemical damage, and mistakes in copying. Because this sort of damage is passed on to offspring, it tends to accumulate over time. For this reason, genes must be edited every so often to repair the acumulated mutations (biologists call damage to genes mutation). Autism symptoms appears at 12-15 months, precisely when the MMR vaccine is administered. AMISH COMMUNITY: NO VACCINATIONS = NO AUTISM – Despite constant efforts by the Medical Establishment to suggest Autism occurs amongst the non-vaccinated Amish (1 in 10,000 claim) there are in fact no proven cases to show for it – “Unfortunately our autistic daughter — who’s doing very well, she’s been diagnosed with very, very severe autism — is adopted from China, and so she would have had all her vaccines in China before we got her, and then she had most of her vaccines given to her in the United States before we got her. AUTISM RATE NOW AT 1 IN 50 (1 IN 38 FOR BOYS): Far more children have autism than previously thought, a study of British school pupils has found. Researchers now believe as many as one in 60 children has some form of the condition. The disturbing findings, which are due to be made public within weeks, mean that up to 216,000 children in the UK could suffer from an autistic condition, although many have not yet been diagnosed. We hope to gain new insights into the causality & manifestations of autism with an exhaustive, scientific approach. Registration is required to participate in this study. See you there! I was just sent a link to your website. I already like the name of your group because we are under what I call Planetary Military Occupation. This is an exhaustive article on all of the dangers of what amounts to biological weapons unleashed by uniformed officers in white coats. We can add that Hepatitis B surface antigen, like most endotoxins found in tetanus and diphtheria and other vaccine components like adjuvants are self-assembling molecules that co-opt the machinery of the nucleus. This can result in chronic fatigue in the least since you are now making a foreign protein(s) and Morgellons at the worst since these are molecular construction scaffolds. Pertussis toxin is used to shut off Neutrophils in the lab so imagine what it does inside the body. The greatest crime is the lie that is believed that somehow a newborn that has no working thymus could even respond to a Hepatitis or Tetanus vaccine immediately after birth. This is a patent lie and therefore fraud. infrequently, the organism is isolated from patients who do not have tetanus. result demonstrates very low or undetectable anti-tetanus antibody levels. All my best to your efforts. Give ’em Hell.